Not my usual kind of literature. Heck, I do not even have a category for a biography. I read an article about Elon Musk (1971-) best known for owning the Tesla factories, and how this man thinks differently from most people. A friend had just read this biography and by way of variation in reading, I decided to give it a go as well. I did not exactly read Elon Musk: Tesla, SpaceX, and the Quest for a Fantastic Future in one take. During holidays (after finishing other books that I brought) I read quite a part of the book, but after that it mostly acted as ‘time-fill-up-reading’. The book is not bad or boring or something, but not as groundbreaking as some suggest. Elon Musk was born in South Africa in 1971. He had an adventurous father and an equally adventurous uncle. Also his youth was not too easy. Musk was a nerd and the whole school knew it, so he was picked upon often. Musk also was an avid reader. So badly even, that after he finished the entire local library, he just started to read encyclopedia. What is more, he remembers everything that he read. Also in his early days, Musk developed a perseverance that is almost unprecedented. Having fallen in love with computers and his self-taught coding, Musk rolled into projects in the early days of the internet. Two of the most notable were his ideas to make some sort of online Yellow Pages with inbuilt navigation, the next was an online bank. Musk would oversee completion of neither project, but he did make a lot of money of them. (The banking project would become Paypal without Musk.) This money allowed Musk to pursue his much further-reaching ideas. In a nutshell. In 2003 Martin Eberhard and Marc Tarpenning started with Tesla, a year later Musk stepped in with his big bucks and his big ideas. In 2006 Musk talked his nephews Peter and Lyndon Rive into starting a company making solar panels called SolarCity and became investor and board member. In 2008 Musk gathered people and started a space company called SpaceX. These are the three best-known of Musk’s companies. In the course of the book you will get many, many details about the ups and downs of each company and the way Musk leads this companies: (almost) tyrannically and with a long-term vision decades ahead of anybody else. 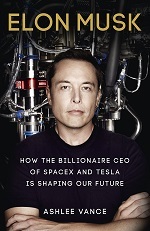 Musk is both vilified and idolized and the book gives a good idea how. Here we have a man who sets out to try to save the world by making electric cars and solar energy affordable, but since he is not sure that we can make it, he already plans a way for human kind to survive on Mars. These plans span a period longer than his own life, but since there is no time to waste, not only renewable energy, but also space travelling should be affordable, stable and frequent in the near future. The way Musk works towards these goals is exactly what this book is about. Indeed a look inside the head of a person ahead the rest of human kind in thinking. Somebody who has goals and goes to extremes to achieve them. Are we going to see a shortage in the production of batteries for electric cars in the near future? Build your own “mega factories”! How do you get many people on Mars? See that you can launch rockets multiple times a day instead of once a year. If these things cost Musk a couple of million of dollars of his personal wealth with the risk of loosing them? So be it. Vance interviewed people close to Musk, people who used to be close to Musk and in the end, Musk decided to be interviewed himself. He will probably not always be overly happy with the book, since the author does not only highlight his good side, but I guess this biography is a fair overview of an extremely driven man; a man with a vision other than making a lot of money or selling gadgets, somebody who is prepared to go further to achieve goals that many governments seem to want to achieve as well. Perhaps we need more of people with a vision and the means to try to achieve them. Not that Musk has only brilliant ideas though, but you can read all about this in this book. The author seems to have went from being an interested outsider to a ‘Musk-fan’ during the writing of this book. Sometimes the praise seems to be too easily given, but -like I said- Vance does not shy to describe the less-praiseworthy traits of Elon Musk.